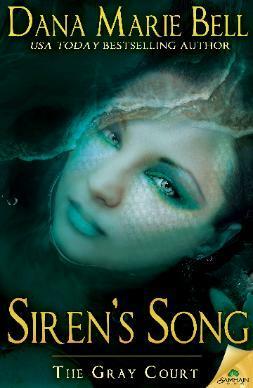 Siren’ Song is the latest in Dana Marie Bell’s Gray Court series. This is a most inventive and imaginative world, filled with all sorts of mythical beings and intriguing undercurrents. Each book builds on the one before; although each can be enjoyed on its own merits, the series is best read in order. Oberon is High King of the Gray Court, and ultimate ruler of both the Black and White Courts of Fae. He has been alone for centuries, having been betrayed by Titannia, Queen of the Black Court, and once his bonded mate. When Oberon goes missing, his heir and friend Robin Goodfellow is determined to get his King back safe. When Shane Dunne sends Princess Cassandra Nerice out to find Oberon, Robin understands that everything that has or will happen has been foreseen by Shane and the Seer. When Cassie finds Oberon on the road, he has no memory of who or what he is, but he instinctively trusts Cassie to help him. Cassie knows she is Oberon’s truebond, but believes he will reject her once she is able to restore his memory and health. The intrigues of the three courts become intertwined when Oberon finds that he has been poisoned, and that his true bond’s life is in danger. Who is behind the plot to start a war; is it the Black court, under Queen Titannia, or the White Court of Gloriana? Can Cassie finally find the happiness she deserves with Oberon? I enjoy this world, where magic runs through each and every being, and where mere mortals mingle and mix unknowingly. Ms. Bell creates the most charismatic characters, people you enjoy knowing and look forward to seeing again. Oberon is high king over the three courts of faerie, and his power is absolute. He is powerful and strong, reserved except with a very few of his closest friends. He is seen as cold by those outside his immediate circle, but he has had to be so after the dissolution of his bond with Titannia. He has no desire for another mate, until he hears the prophecy and then meets Cassie while on the run from those who would see a war started between the Black and White Courts. I like Oberon, with his staid demeanor and his small but wicked flashes of humor and his determined protection of his bondmate, Princess Cassandra Nerice of Atlantis. Cassandra ‘Cassie’ Nerice is a strong and determined woman, a healer and sensitive woman. She is not a ‘conventional’ beauty, but has strength of spirit that shines through to all who get to know her. I enjoyed watching as Cassie found her way in the world of the Gray Court, and as she learned how caring and intriguing Oberon can be. I loved that she was sassy and sarcastic, and was able to match wits with Robin as well as with Oberon, and that she brought some light and passion to the High King’s life. There are some seriously dangerous moments for Cassie and Oberon, and Court intrigues that are, at first, mysterious in origin. It took some time for the truth to come out about who was behind the machinations of it all, and the solutions were, in a few cases, severe and unyielding. The chemistry between Oberon and Cassie is strong and passionate, and this is a most enjoyable visit to the Gray Court. I highly recommend this series by Dana Marie Bell, and it is best to be warned that there will be lots of laughter, some tears and some sighs along the way to the thoroughly satisfying conclusion to this book. I look forward to the next Gray Court adventure and a visit with old and new friends.